I love creating flower crochet patterns - dreaming up my own flowery shapes and working out how to get the petals looking just right, how many stitches go where, or even how to join the round neatly! Another two rounder, very stylish with its elegant picot petals! 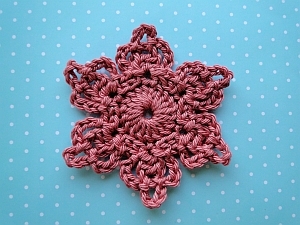 The Whirly Flower Crochet Pattern! This lively little flower will cheer you up over a weekend! 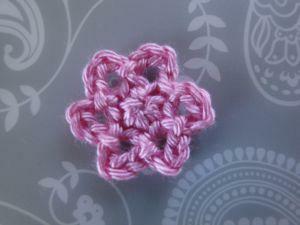 It's fast and easy to make - only two rounds of crochet :) And it has bags of character! I loved the way this flower came out, so hope you like it too. 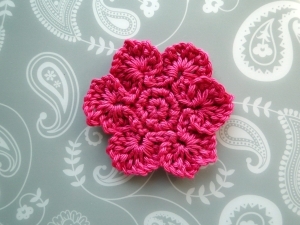 My written pattern and photo tutorial show you exactly how to make this dainty little flower. Don't miss my bullion stitch tutorial if you're new to making bullions! Use as a delicate embellishment all by itself. Or join your picotifs together - I show you how. Stylishly pointed leaves worked along a chain - easy and fun to do, and great for an edging or decorative feature. Off we go with another circle and 3 ch loops worked around the outside. 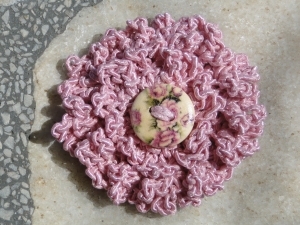 After that we crochet two rounds of slip stitches which create this ridged edging, making for a 3D effect flower. 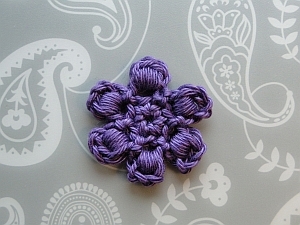 Make a button flower if you like, as your button can sit beautifully in the middle. 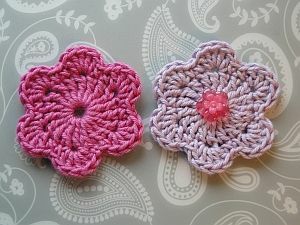 A larger and a smaller flower to crochet, both joined together with a button of your choice to make a beautifully original applique or brooch. Check out the pattern for how-tos and pix. Featuring a raised middle and a simple yet effective edging, this flower really is... blooming lovely! Careful tension is needed to keep your stitches even, but the result is a super original piece that you will be proud of. 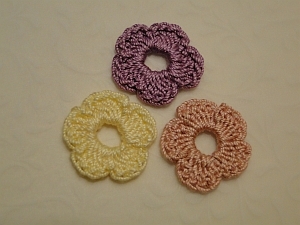 A simple circle started with a magic ring, then rectangular "petals" for the second round, followed by a third round of 5 ch loops crocheted around the rectangles. Fun and easy to make, you might like to join your flowers together - find out how! 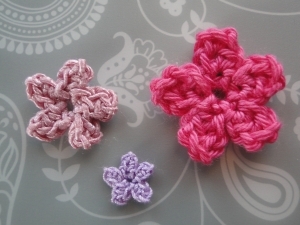 A flower crochet pattern with a difference! Yes, I think you'll enjoy the construction of this piece - a chain of 19, with loops picked up along the chain then joined together with one long pull-through of the yarn - what a marvelous feeling!!! 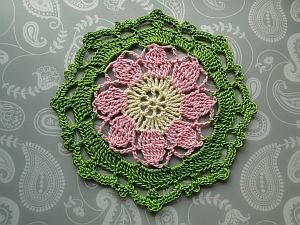 This pretty flower is based on an "heirloom" mat that came into my possession recently. 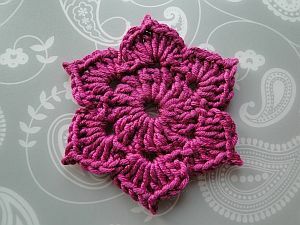 Taking this pattern further, you can also crochet the octagon flower below, which is the same flower pattern minus the picots plus a few more rounds. 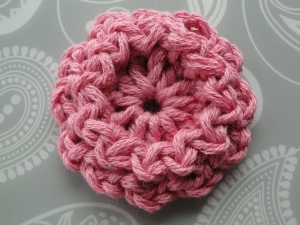 This flower crochet pattern is quite an adventure! 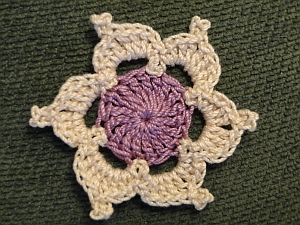 Lots of stitches worked into the loops of the first round, forcing the petals to overlap each other slightly. 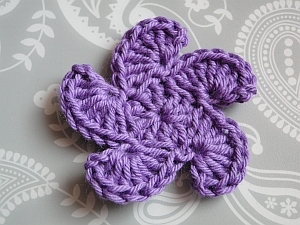 This is such pretty little flower, so easy to make! 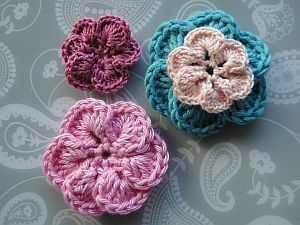 Transform your fleurettes into a brooch or necklace - I'll show you how! 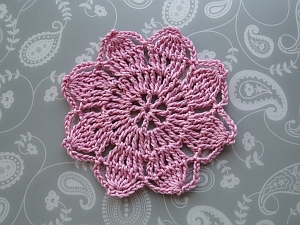 Five petals worked in one round make a wonderful little project for you! Use different weight yarns. Crochet them in sc, hdc or dc - that's dc, htr or tr for the UK-ers! The same technique is used for them all - and they combine to make lovely layered flowers, too. 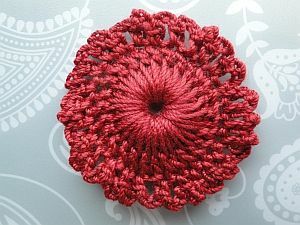 A simple flower crochet pattern - and a fast project for those of you in a rush to add a little flower to something NOW!!! With only one round to work, you make can a whole bunch of pretty blossoms. 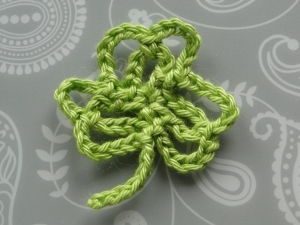 Just in time for St Patrick's Day, a quick and easy shamrock. 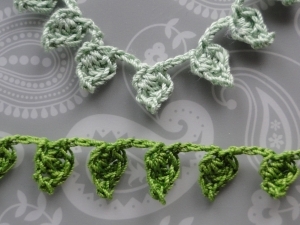 Make as an appliqué or chain together for a garland. Full instructions and photo tutorial in both US and UK terminology.